After I heard her say this I thought, “WoHOO! This is the vision statement for everyone who creates genuine relationships to inspire the joy of investing in non-profit missions! We create a more generous world! Let’s dial down the drama and compose a good world. I will inspire you to Artfully Ask for Anything and unleash a lifestyle of generosity! YOU! The one passionate about creating a good world. YOU! The one who knows MORE Major Gifts will catapult your impact! WoHOO! Raise MORE Money! Do MORE Good! Embrace, “Something Good is gonna happen to me!” and adapt a mindset for success! Dig deep into your thinking – You become what you think about! 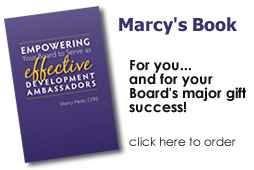 Would you like to be more comfortable and successful raising major gifts? Do you feel like you’re working harder and still not reaching your giving goals? Do you need to be inspired again? Does the whole team need to get excited again? Do you wish your board, volunteers or faculty would help more (or at all!) in the fundraising and development process? Wouldn’t it be great if they actually liked it? Over the course of twenty plus years of in-the-trenches major gift fundraising and management at the University of Wisconsin Foundation, I developed a deep respect and energy for the impact and joy philanthropy brings to our organizations, institutions and communities. 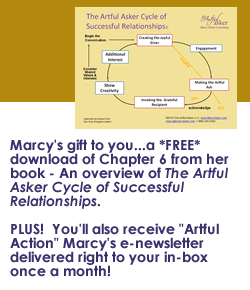 Now I coach and share the mindset and authentic relationship-building actions so you, too, can experience major gift success and have the resources to compose your good world…and enjoy your life. Here’s a short segment of Marcy presenting “Making an Artful Ask” at the Fundraising and Development for Nonprofits Conference in Madison, Wisconsin. 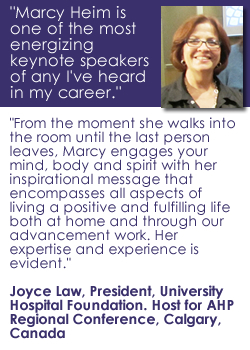 Held every year Wednesday to Friday of Memorial Day week, Marcy has been part of this distinguished faculty for over twenty years.